– Norman Fischer on the practice of Lojong. This month we’re particularly reflecting on the kindness, generosity, flexibility, and resilience of our neighbor friends on Rocky Creek Road. They inspire our practice constantly and motivate us to grow forward in ways we couldn’t have imagined before coming to the sanctuary. With every new challenge mother nature, the roads, or people trying to work together in difficult circumstances present, they seem to meet it all with creativity and quiet resolve. These folks are usually operating “under the radar” with their help and support – a kind word in passing on the road, a basket of some of their harvest to share, or advice on how to tackle the latest landscape or infrastructure challenge when asked. They teach us how to be humble and navigate all of the uncertainty with grace and humor. They have accommodated and invited us in to their community and for that, we are so very grateful. Aaron Patch (helped us get our water restored soon after the fire) helped build our new bridge and is now helping with landslide mitigation before the rains. Aaron’s brother, Brian Patch helped us clean-up debris after the fire and continues to maintain our fragile Rocky Creek Road. Charlie Cascio (and goats) who took us under his wing from day one. Also, Mike Doig helped us set-up and maintain our solar and hydroelectric systems and continues to consult to us about powering future construction. Our former next door neighbor Todd Reilly (who lost everything and had to leave the mountain after the fire) and previous sanctuary owner Brian Lyke provided much needed history of the infrastructure (and tips for maintaining it) on the land. Finally, a big thank you to Pam Peck (who leads our emergency call chain) and Patty Ebert for organizing the Rocky Creek Road Repair fundraising effort. We are about $100,000 on our way to the $600,000 goal by next summer. Go team! If you feel inspired to contribute to the recovery effort, see our wishlist or donate here. Stay tuned here for more opportunities to help. This entry was posted in What's New at Sweetwater. Bookmark the permalink. 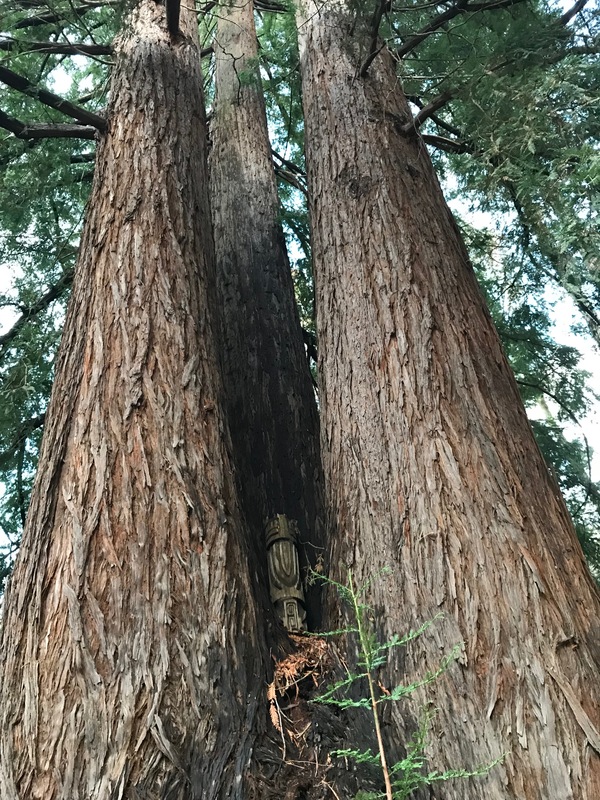 Sweetwater Sanctuary's three jewels - a trio of several hundred year old redwoods remain as the gatekeepers to the hermitage.